Jean-Luc Picard (13 July 2305–) is a character in the Star Trek fictional universe, the captain of the USS Enterprise-D and the Enterprise-E. He was played by British actor Patrick Stewart in the television series Star Trek: The Next Generation and subsequent films. That is what it is to be human. To make yourself more than you are. Things are only impossible until they're not! Shall I tell you what true evil is? It is to submit to you. It is when we surrender our freedom, our dignity instead of defying you. The Prime Directive is not just a set of rules; it is a philosophy ... and a very correct one. History has proven again and again that whenever mankind interferes with a less developed civilization, no matter how well intentioned that interference may be, the results are invariably disastrous. And the sky's the limit. Catchphrase first used in "Encounter At Farpoint" (28 September 1987) by Gene Roddenberry, and thereafter used in many episodes and films, instructing a crew member to execute an order. Catchphrase first used in "Encounter At Farpoint" (28 September 1987) by Gene Roddenberry, and thereafter used in many episodes and films, instructing a crew member to execute an order sending the Enterprise on warp speed. Part of having feelings is learning to integrate them into your life, Data, ...learning to live with them. No matter what the circumstances ... Sometimes it takes courage to try, Data. Courage can be an emotion too. Someone once told me that time was a predator that stalked us all our lives. But I rather believe that time is a companion who goes with us on the journey and reminds us to cherish every moment because they'll never come again. What we leave behind is not as important as how we've lived. After all, Number One, we're only mortal. Emerging on the Enterprise-E bridge with his humanity fully intact, in Star Trek: First Contact (1996) story by Brannon Braga, Ronald D. Moore and Rick Berman; a derivative of the statement "Reports of my death are greatly exaggerated" attributed to Mark Twain, paraphrasing his remark: "The report of my death was an exaggeration." If your issues are with me, then deal with me. This has nothing to do with my ship, nothing to do with the Federation! Buried deep within you, beneath all the years of pain and anger, there is something that has never been nurtured: the potential to make yourself a better man. And that is what it is to be human. To make yourself more than you are. Oh, yes — I know you. There was a time you looked at the stars and dreamed of what might be. Introduction spoken during the opening credits of each episode, derived from the introduction to the original Star Trek series. Both versions are by Gene Roddenberry; the original referred to a "five year mission" rather than a "continuing mission", and said "no man" rather than "no one". it also reused in Star Trek Beyond. You say you are true evil? Shall I tell you what true evil is? It is to submit to you. It is when we surrender our freedom, our dignity instead of defying you. Your Honour, the courtroom is a crucible. In it we burn away irrelevancies until we are left with a pure product, the truth for all time. Let's make sure history never forgets the name ... Enterprise. "Sins of the Father" (19 March 1990) by Drew Deighan; after being challenged by a Klingon to fight who said that Picard as a Federation officer would not fight. I am Locutus of Borg. Resistance is futile. You know, there are some words I've known since I was a schoolboy. "With the first link, the chain is forged. The first speech censured, the first thought forbidden, the first freedom denied, chains us all irrevocably." Those words were uttered by Judge Aaron Satie as wisdom and warning. The first time any man's freedom is trodden on, we're all damaged. Picard had been captured by the Cardassians and had been tortured. The torturer had constantly asked Picard how many lights did he see. Every time Picard answered he was electrocuted and told there were five lights.The﻿ point the Cardassian was trying to make is he broke Picard. In the end Picard showed his torturer that he didn't win, and told him how many lights there were. No, I am not dead. Because I refuse to believe the afterlife is run by you. The universe is not so badly designed! Now, this will put the ship at risk. Quite frankly, we may not survive. But I want you to believe that I am doing this for a greater purpose, and that what is at stake here is more than any of you can possibly imagine. I know you have your doubts about me, about each other, about this ship.All I can say is that although we have only been together for a short time, I know that you are the finest crew in the fleet. And I would trust each of you with my life. So, I am asking you for a leap of faith — and to trust me. So, five-card stud, nothing wild. And the sky's the limit. Captain Picard, is the exact opposite of a Hollywood action-hero. Captain Picard is the hero we need right now. He exemplifies in some ways even more then James Kirk—and I’m not gonna get into the Kirk vs Picard argument because I love Captain Kirk, he was my first captain—but Picard is even more of an exemplar of everything that is best about Star Trek’s vision for the future. Michael Chabon, "Captain Picard is the hero we need, says Star Trek writer Michael Chabon", by Richard Trenholm, CNET, (11/7/2018); as quoted in "Michael Chabon on Honoring Star Trek Canon and How Picard Is 'The Hero We Need Right Now'", by Beth Elderkin, IO9, (11/9/2018). Picard stands as the bearer of Starfleet's conscience and an exemplar of moral autonomy. Captain Picard is perceived to be a gentler soul than Captain Kirk. The new captain of the Enterprise, Jean-Luc Picard, is the wise man. He rules the Enterprise with a sagely wisdom. As shown in his speech and actions, Picard is a man of intelligence, courage, integrity, compassion, courtesy. Patrick Stewart's identification with Jean-Luc Picard is a prime exemplar of the extreme entanglement between actor and character produced by cult television programs, yet in Stewart's case this entanglement has not precluded a very active and successful post-Star Trek career. Those ... who are familiar with the character Captain Picard, already know him to be the leader that we all wish we worked for, whose leadership gives us confidence and comfort in meeting the challenges we face each and every day, and the type of leader that we should strive to become. The bridge of the Enterprise, under the moderate and controlled command of Captain Picard, is a locus of "enlightened understanding." 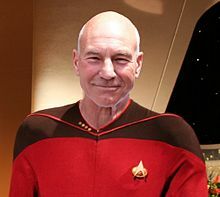 The new captain, Jean-Luc Picard, was French and enjoyed reading, classical music, William Shakespeare, archaeology, and theatre. Captain Picard is not the swashbuckler that Captain Kirk was. Or do I like Picard?